Historians of British prison reform and genealogists seem to be doing a good job at filling in the details of William Cunningham’s life after he served as provost martial (or marshal) for the Crown forces throughout the war. Which leaves his life before the war as the big mystery. The Loyalist judge Thomas Jones (1731-1792) used his exile in Britain in the 1780s to write a History of New York During the Revolutionary War. In it he called Cunningham “a Son of Liberty who had become disaffected.” That manuscript was published by the New-York Historical Society in 1879. Two members of the Sons of Liberty, John Lamb and William Cunningham, the latter afterward known as the notorious Marshal Cunningham of the Revolution, were appointed to purchase a plot of land, which they selected, adjoining the common, where, upon the 6th [Mar 1770], the pole was raised in the presence of about four thousand spectators. It was of immense proportions, banded with iron hoops and braced with rods, imbedded in the earth between rocks, and secured with masonry. Thus was the fifth pole raised by the Liberty Boys. Unfortunately, those books don’t cite any documentary sources for their statements about Cunningham. Exactly five years after that fifth pole was erected, on 6 Mar 1775, Cunningham and a man named John Hill got into a fight with Patriots near Liberty Pole. The crowd roughed up both men badly. Newspapers published conflicting stories of what happened, depending on which side of the political divide they stood. The only thing clear was that Cunningham was now on the side of the Crown. Indeed, the royal government was soon employing Cunningham, if it didn’t already. Authorities sent him to arrest the Patriot activist Isaac Sears the next month, and a crowd assaulted Cunningham again. 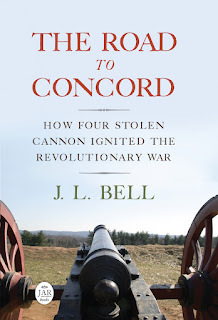 When the war broke out, Cunningham and Hill took off for Boston. Hill was eventually an assistant to Crean Brush, a Loyalist given a job by the military authorities. Cunningham became provost martial and held that position again in New York, Philadelphia during the winter of 1777-78, and New York until the end of the war. I’ve found a hint of romance between Hill’s daughter Mary and Cunningham’s son Ralph, but I’ll save that gossip for later. I don’t know the historical sources in New York, and perhaps there’s more documentation of Cunningham’s life before the war. We do know that the 1792 “Dying Confession” ascribed to him is unreliable. But was he born in America or an immigrant (which seems more likely)? What caused him to join the Sons of Liberty in 1770 and to turn against them by 1775? Kudos for opening up the conversation about Cunningham. Thanks especially for the clarification about Binn. Another question--which I devote a few pages to in my book Forgotten Patriots--is who fabricated his "confession," and why. Any thoughts? I haven’t dug into that question as you have. I think you’re right that the “confession” was a product of the relatively wide-open publishing world of the early republic. Probably someone who had sources on Cunningham’s wartime career and also access to newspapers for that story on the immigrant ship. One question is whether the author was trying to fool people or whether the essay was intended as a sort of satire which readers would recognize. Agreed. I nominated Eleazer Oswald, who fills those shoes perfectly, but at this point it's only an educated guess.